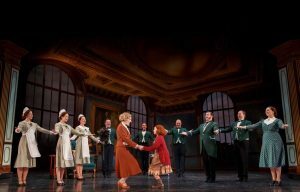 When it comes to “Annie,” hope – no matter if it’s during the Great Depression or in a year of political turmoil – always springs eternal. Fish and a cast that includes Tori Bates (Annie), Gilgamesh Taggett (Oliver Warbucks), Casey Prins (Grace Farrell) and Jeffrey B. Duncan (President Franklin Delano Roosevelt) will tell the eternal tale of an orphan finding a family when “Annie” takes the stage at the Modell Performing Arts Center at The Lyric for three shows from April 21-22. 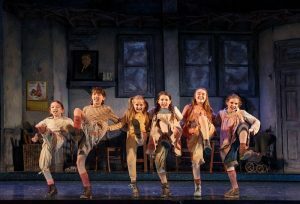 “Annie” is known as much for its story as the music that accompanies the musical, which is directed by original lyricist Martin Charnin and choreographed by Liza Gennaro. Bates, a red head, stars as the title character who escapes the orphanage in search of a new home. Meanwhile, Fish puts a comedic spin on Miss Hanigan, a role made famous by Carol Burnett in the 1982 hit movie that was recast in 2014 and made more than $133 million worldwide. The original production of “Annie” debuted on April 21, 1977 at the Alvin Theatre and went on to win the New York Drama Critics Circle Award for Best Musical, seven Drama Desk Awards including Best Musical, the Grammy for Best Cast Show Album and seven Tony Awards, including Best Musical, Best Book (Thomas Meehan) and Best Score (Strouse, Charnin). “Annie” was endured decades. It remains one of the biggest Broadway hits of all time, as it ran for 2,377 performances after opening. It has since been performed in 28 languages and has been running somewhere throughout the world for the past 39 years. When: April 21: 7:30 p.m.; April 22: 2 p.m., 7:30 p.m.
Tickets: $32-$62 and can be purchased here.